Columbus Travel's Andes Tours or Andes Short Tours combine the most ideal trips in order for you to see, taste, feel and hear the beautiful Sierra that makes up the distinct and diverse Andean culture Ecuador is known for. Bargain for deals in the oldest Indigenous Market in Latin American in the town of Otavalo, visit Cotopaxi, one of the tallest active volcanos in the world, or explore the lush Cloud Forest of Mindo, perfect for bird watchers. 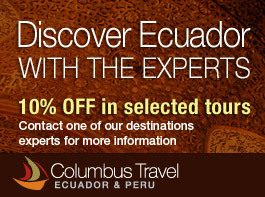 There are many other Andean Highlights Columbus Travel has organized for you, have a look at each one below. Guests interested in activities also searched for the following Ecuador and Peru Tours: Quito and Quayaquil City Tours, Peru Tours, and Andean Hotels and Haciendas.